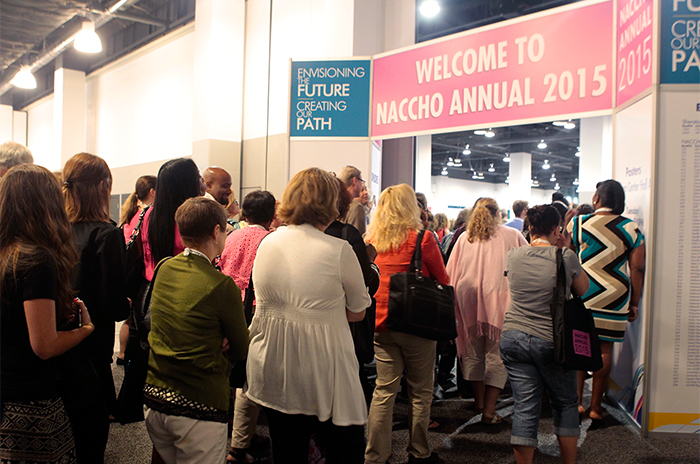 More than 1,300 local health department leaders and public health partners attended the 2015 NACCHO Annual Conference, July 7–9, in Kansas City, MO. Drawing a record number of attendees, the conference provided participants with access to public health thought leaders, innovative strategies and evidence-based practices, and unmatched opportunities for networking with peers. 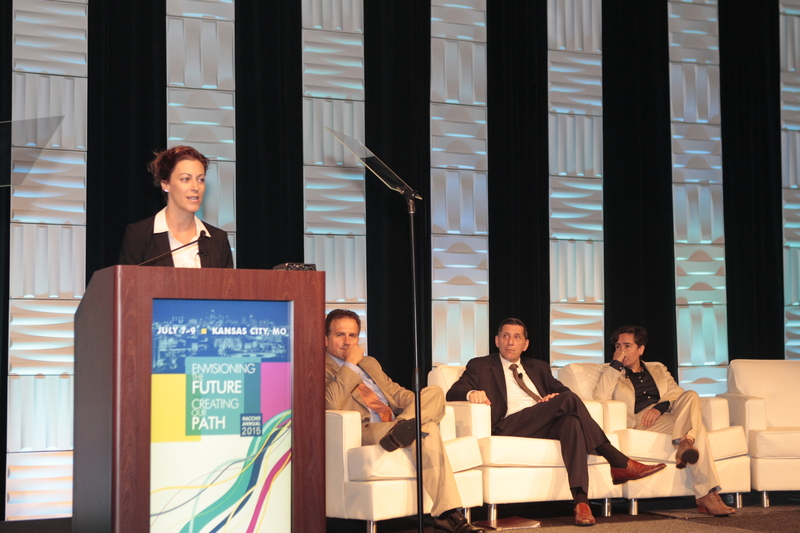 The theme of the conference was “Envisioning the Future: Creating Our Path” and focused on the critical role of local health departments in the wake of healthcare reform. Several additional themes emerged during the conference, including promoting linkages to care, implementing continuous quality improvement, leveraging partnerships and collaborations, and maximizing the use of new technology. Sessions also focused on a variety of topic areas such as maternal and child health, tobacco, violence and injury prevention, emergency preparedness, chronic disease, and informatics. 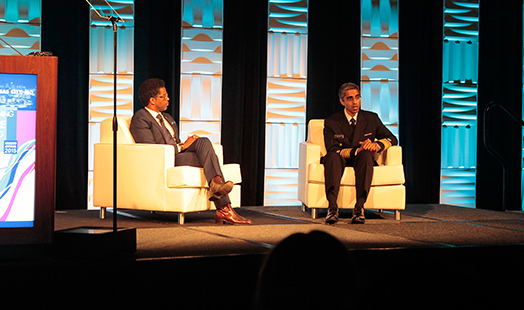 The opening general session on Tuesday, “Envisioning the Future: Creating our Path,” featured two prominent public health leaders: Tom Frieden, MD, MPH, Director of the Centers for Disease Control and Prevention, and Vice Admiral Vivek Murthy, MD, MBA, 19th U.S. Surgeon General. Dr. Frieden joined attendees by video conference. He discussed the joint enterprise of public health at the local, state, and federal levels and described the need for continued support for local health departments. Dr. Murthy shared his public health journey and explained how his office’s agenda dovetails with the work of local health departments. Both officials emphasized the importance of prevention, noting that local health departments are and will continue to be an important catalyst in helping communities realize health. “Failing to invest in prevention is literally killing us,” declared Dr. Murthy, underscoring the need for creating a culture of prevention in the U.S. The action areas he’s identified for his term include physical activity, nutrition, mental health, tobacco, prescription opioid abuse, and violence. In addition to prevention, health equity is a guiding theme of the Surgeon General’s agenda. He described his commitment to ensuring the promise of good health for all Americans and noted that many policymakers in the nation’s capital are starting to pay attention to health disparities. Learn more about health equity at http://rootsofhealthinequity.org. Attendees also heard about the launch of The Foundation for the Public’s Health, a foundation that seeks create a new model of support for local health departments. The foundation will provide local health departments with financial and consulting assistance and educational opportunities in fund development. Learn more about The Foundation for the Public’s Health at http://www.tfph.org. On Wednesday, attendees heard from NACCHO’s Executive Director LaMar Hasbrouck, MD, MPH, about his vision for the future of NACCHO. He emphasized the importance of the local context for health and praised NACCHO members for the far-reaching impacts of their work. He also described how NACCHO will continue to support local health departments in new and innovative ways under his leadership. The Wednesday general session, “The Opioid Epidemic: A Call to Action for LHDs,” explored the devastating impact of opioid addiction and overdose in the United States. Panelists included Michael Botticelli, MEd, Director of the Office of National Drug Control Policy; Oxiris Barbot, MD, First Deputy Health Commissioner, New York City Department of Health and Mental Hygiene; Jennifer Walthall, MD, MPH, Deputy State Health Commissioner and Director for Health Outcomes, Indiana State Department of Health; and facilitator Vince Caraffi, RS, MPH, Supervisor, Cuyahoga County (OH) Board of Health. Botticelli underscored the crucial role local health departments play in advocating for judicious prescribing practices, increasing access to naloxone, and reducing misconceptions around medication-assisted treatment and syringe exchanges. He emphasized that drug addiction is not a moral failing and expressed his office’s support for alternatives to incarceration for drug users. He also noted the efficacy of medication-assisted treatment and stated it should be the standard of care for opioid use disorder. Dr. Barbot shared New York City’s efforts to curb opioid overdose death. She stressed the importance of naloxone for preventing opioid overdose, noting that the city’s health department has distributed 10,000 naloxone kits to drug users, shelters, and jails; additionally, more than 12,000 police officers in New York City have been equipped with naloxone. She also explained that 14 syringe exchanges in the city have been critical to preventing the spread of HIV among intravenous drug users. Dr. Walthall discussed the opioid-related HIV epidemic in Scott County, IN, and described her agency’s efforts to control the epidemic and treat affected residents. The Indiana State Department of Health established a community outreach center to conduct HIV testing and contact tracing, enroll residents in insurance, issue driver’s licenses, and more. She explained that the epidemic is the result of a pervasive lack of education and opportunity; building resilience in a community of hopelessness was one of the most daunting aspects of the epidemic in Scott County, she told attendees. View NACCHO’s policy statement on the prescription drug abuse and overdose epidemic at http://bit.ly/1Sq1Nqz; find the policy statement about syringe exchanges at http://bit.ly/1V8hsir. On Wednesday evening, conference-goers celebrated this year’s award winners at the Grand Awards Ceremony and Reception—including 19 Model Practice Award winners, three Local Health Department of the Year awardees, and the Maurice “Mo” Mullet Lifetime of Service recipient. Read more about the award winners at http://naccho.org/press/releases/na15-awards.cfm. On Thursday, 2015–2016 NACCHO President Swannie Jett, DrPH, MSc, Health Officer, Florida Department of Health in Seminole County, addressed attendees. He called for increased funding for local health departments and noted that issues such as poor health outcomes, poorly built neighborhoods, and lack of access to care affect everyone through higher healthcare premiums. Read more about Dr. Jett at http://www.naccho.org/press/releases/new-president.cfm. Thursday’s general session, “Strengthening LHD Capacity to Pursue Health Equity through Community Organizing and Public Health Strategies,” featured a dynamic panel comprising Linda Rae Murray, MD, MPH, FACP, Adjunct Assistant Professor, University of Illinois School of Public Health; Rex Archer, MD, MPH, Kansas City (MO) Health Department; Renee Canady, PhD, MPA, Director, Michigan Public Health Institute; and Kathryn Evans, MPA, Project Manager, United Community Services of Johnson County. The panelists discussed innovative strategies for disrupting systemic patterns of injustice that result in unequal health status. Dr. Murray underscored the importance of understanding and acting on the social determinants of health to achieve health equity. She noted that the time when public health has been most closely aligned with social movements were the times when public health most progressed. She stated that the predominant way resources are distributed in the United States is by class, race, and gender. Dr. Canady shared her model for successfully addressing the social determinants of health, which included building deep relationships with community organizers to effect change. She noted that public health professionals must use the tools of public health and community organizing to reframe the predominant narrative and create a trajectory of change. Dr. Archer described the work of the Kansas City Health Department to address the social determinants of health. He noted that while 47% of deaths in Kansas City are attributable to social factors, his department doesn’t spend nearly a proportional amount on addressing those factors. He explained that because local health departments don’t always have ample resources to address the social determinants of health, partnering with community organizers is critical to achieving health equity. The first step of such partnerships, he noted, should involve identifying areas of shared values between local health departments and organizers. Evans described her background in community organizing and noted that “the commodification of people is the greatest challenge we’re facing in public health.” She emphasized that power is critical to organizing and public health and encouraged public health practitioners to ask themselves the following questions: “What is the story of public health? What is your analysis of power in your context? Who is your base?” She closed her presentation by underscoring that public health practitioners need to play a critical role in reshaping the predominant narrative of how society understands the far-reaching health effects of structural racism, class oppression, and gender inequity. Learn more about NACCHO’s health equity and social justice initiatives at http://naccho.org/topics/justice/; find health equity publications at http://bit.ly/1cnQ90A. Save the date for the 2016 NACCHO Annual Conference, July 19–21 in Phoenix, AZ. The theme is “Cultivating a Culture of Health Equity.” Watch this space for more information. This entry was posted in NACCHO Annual 2015 on July 20, 2015 by nacchovoice.